Academy Award- and Emmy-winning Leonard Rosenman (1924-2008) – celebrated composer of East of Eden, Rebel Without a Cause, Fantastic Voyage and Star Trek IV: The Voyage Home – also wrote music for other media. 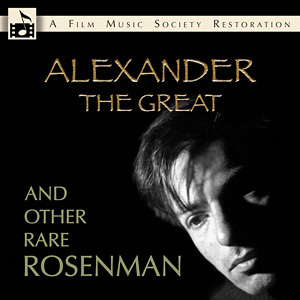 The Film Music Society, the entertainment industry-based preservation group, has recently rescued and restored some of Rosenman's music from four historic television productions and a theme park attraction, and is releasing these archival recordings on a 76-minute CD called Alexander the Great and Other Rare Rosenman. Click select links to hear sample audio tracks. Centerpiece of the album is Rosenman's original music for the legendary unsold television pilot Alexander the Great, which starred William Shatner and was a candidate for the fall 1964 season on ABC. Rosenman composed a massive choral and orchestral score for this epic set in the first century B.C. It may be the most ambitious score ever written for an unrealized television series. Also included are 19 minutes of music from the original first-season library of television's landmark war series Combat!, composed and conducted by Rosenman in Rome in 1962; excerpts from Rosenman's Emmy-winning score for the 1976 miniseries Sybil, including an unreleased recording of a song, "I Remember Me," written for the miniseries by Rosenman and lyricists Marilyn and Alan Bergman, and performed by noted vocalist Shelby Flint; and selections from his touching score for one of Michael Landon's final projects, the Emmy-nominated Where Pigeons Go To Die (1990) which starred Art Carney. Rounding out the album is his music for Body Wars, composed in 1989 for a project directed by his friend Leonard Nimoy, with whom he worked on Star Trek IV. Body Wars was a theme-park attraction at Walt Disney's EPCOT Center in Florida; the ride was a journey through the human body that was reminiscent of Fantastic Voyage, which Rosenman had scored in 1966. This remarkable collection, produced by Marilee Bradford, is accompanied by a 16-page booklet containing rare photographs with album notes by Jon Burlingame. Alexander the Great and Other Rare Rosenman is a limited edition of 1000 copies and is available beginning Monday, August 6, only to members of the Society. The price is $20 plus shipping/handling ($5 domestic; $6.50 international). Membership is open to the public; basic annual membership is $50, fully tax-deductible. For sales or for more information, contact the FMS at shop@filmmusicsociety.org. For sale to members only! David Raksin Remembers His Colleagues: Hollywood Composers, is a collection of fascinating essays written by Mr. Raksin in association with a festival of classic film scores at the Stanford Theatre in Palo Alto, California in April 1995. This limited edition is now available for purchase only through The Film Music Society, and only by members! Each essay offers candid insight into the life and career of some of the most important composers in film history  Aaron Copland, Hugo Friedhofer, Bernard Herrmann, Erich Wolfgang Korngold, Alfred Newman, Miklós Rózsa, Max Steiner, Dmitri Tiomkin and Franz Waxman, along with an autobiographical essay  all from Mr. Raksin's unique perspective. A limited number of these books are available to members only for $20 plus s/h. Please call, write or email us to buy your copy.